On December 31, 2010, copper continued its 2 year long ascent to a record high of $4.452 a pound as the global economy stumbled out of the most severe recession since World War II. According to Barclays Capital, supplies of copper will lag demand by 825,000 metric tons in 2011, almost double this year’s deficit of 449,000 tons. 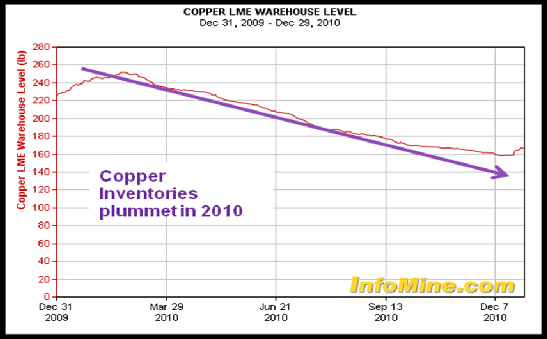 Copper inventories at the London Metal Exchange (LME) warehouses are down 26% in 2010 - the first annual decline since 2004. Heavy bets are being made on the future spot price of copper. On November 24, 2010 the LME revealed that that a single unidentified trader owns about 70% of warehouse inventory – a $1.5 billion stake. Introduction of Exchange Traded Funds (ETFs) may accelerate the depletion of copper inventories, according to Macquarie Bank Ltd.
Copper has tripled in two years on Chinese demand, the largest buyer of base metal. 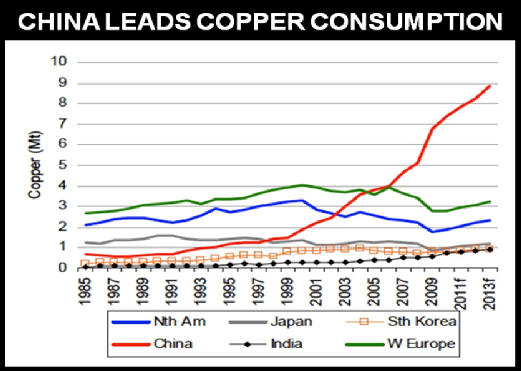 China consumes 40% of the world's copper production but holds only 6% of the world's reserves domestically. With the copper supply / demand fundamentals looking so strong, big cap investors will be drawn to copper mining giants like Freeport McMoran (NYSE: FCX), BHP Billiton (NYSE: BHP), Xstrata (LSE: XTA) and Anglo American (LSE: AAL). But with a collective market cap of about half a trillion dollars, those big trees are not going to triple in size any time soon. The serious money will be made investing in junior explorers proving up a mineable deposit who have the financial pedigree to raise the capital for a mine. One company that fits these criteria is Catalyst Copper (TSXV: CCY) a Canadian junior that has just released an NI 43-101 compliant resource estimate at the La Verde copper project, Michoacán State, México. Using a 0.2% copper cut-off grade, deposits at La Verde contain Measured and Indicated Resources of 2.1 billion pounds of copper and Inferred Resources of 1.3 billion pounds of copper. The independent report indicates a potential for additional tonnage and recommends further delineation drilling around the perimeter of the deposits and at depth. The CCY resource calculation is based on 596 drill-holes totalling 80,606 meters, conducted by previous owners. Results from these historic holes were verified with 11 diamond drill-holes totalling 6,319 meters plus nine definition drill-holes totalling 5,957 meters, completed by Catalyst Copper. Catalyst CEO John Greenslade just raised $823 million for Baja Mining (TSX: BAJ). He has staked his reputation on his assessment that the La Verde project is more straightforward (geologically and financially) than Baja. 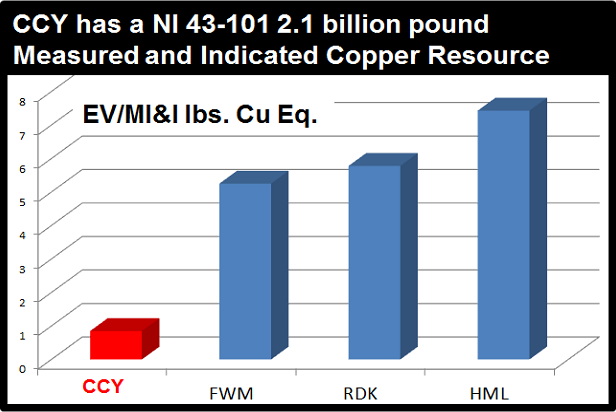 Enterprise Value / lbs-in-the-ground comparisons with copper companies like Hana Mining (TSXV: HML), Redhawk Resources (TSXV: RDK) and Far West Mining (TSX: FWM) suggest that CCY has growth potential. CCY is currently trading at $0.16 and has a market cap of only $35 million. The surging price of copper and John Greenslade’s track record of developing mineable deposits, indicate that Catalyst is a company worth watching. More at CatalystCopper.com . I think Penny stock investments offer huge money making potential to the investors. I have heard many times that investors had got so much profit in penny stock. I want a suggestion from you that if someone has to invest in penny stock then how much he should invest first time?